Welcome to the Wildside Safari Company – and access to some of the best wildlife experiences that Africa has to offer. We specialize in travel in Eastern and Central Africa, the Indian Ocean Islands and Southern Africa. Travel in Africa is about knowing when, where and how to travel. Most wildlife activity and behavior is dictated by weather patterns and the seasons of nature, which in turn impacts on feeding and breeding. Being aware of what happens and when, enables one to capitalize on the best possible wildlife viewing to maximize a seven to ten day safari experience. 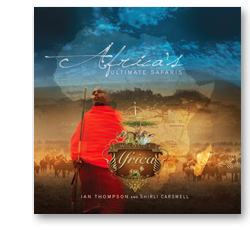 After 20 years of traveling the African continent on filming and guiding expeditions, Ian Thompson and Shirli Carswell of the Wildside Safari Company have compiled a book that captures their favourite safari experiences entitled “ Africa’s Ultimate Safaris” to give clients an idea of the best way to experience Africa. "Our passion is Africa and our dreams revolve around this magnificent continent that we love and never grow tired of travelling. No trip is the same, as each is filled with new experiences and adventures that enrich our lives"
Ian Thompson & Shirli Carswell of The Wildside Safari Company.